I don’t buy many memoirs (and hardly ever hardcovers – too much $$ and just not as comfortable to curl up with), but I always feel inspired after reading about smart, funny women finding success doing what they love. And, at the risk of sounding a bit sexist and gender stereotype-y, I don’t get the same thing from funny dudes, even if they’re super funny and successful. And, don’t get me wrong, I LOVE David Sedaris. Mike Birbiglia is incredibly endearing, and Craig Fergusson, I was totally rooting for you even when you were falling asleep in puddles of your own vomit on the lower east side. I think that may be part of it. If your present comedic success is a stark contrast to your wild past of binge drinking and general irresponsibility, I can’t relate. Tina Fey actually touched on this a bit in Bossypants. She wrote about how most of the women she’d worked with were responsible people. The most rebellious thing that most of them had ever done was pursue a career in sketch comedy. So, as someone who votes, pays her taxes and wants to be full time writer, theses gals are my heroes. As someone who values employer-provided health insurance, a less predictable career choice seems daunting and scary. I may be over 30, but I still need role models and guidance from the pros. These books are my version of Chicken Soup for the Lady Person or 237 Ways to Ignite Your Inner Diva. These ladies help me help myself. All in different ways. And now I’ll pretend I’ve won some kind of award and am delivering my acceptance speech to a roomful of well-dressed strangers. 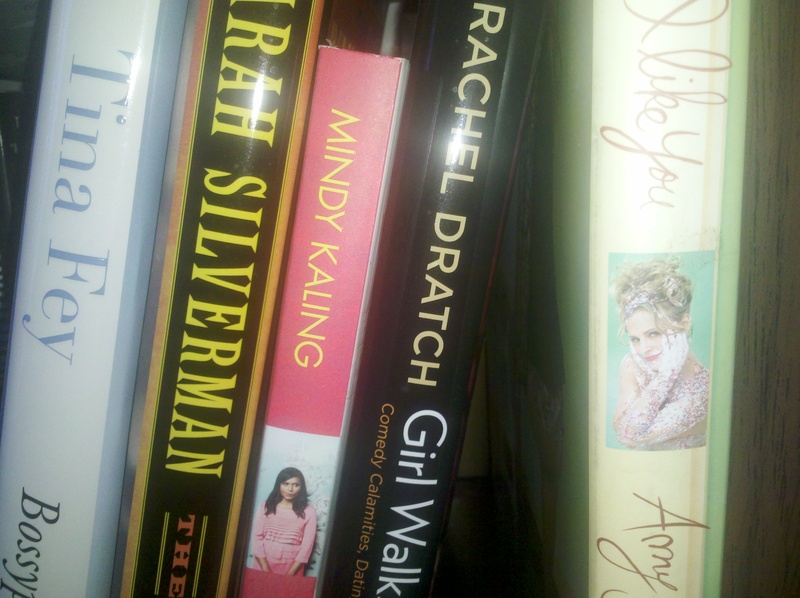 I’ve already thanked my parents and my husband, so there’s time to acknowledge a few of the ladies on my bookshelf. Amy Sedaris: Most people love that you are delightfully bizarre, and I love that too. But I’m even more impressed with your versatility and entreprenerial spirit. You’ve made a career out of acting, writing, crafting, cooking and advocating for house rabbits. You really can do anything… and people will want to watch you do it. Sarah Silverman: I only ever saw you as sassy and fearless before I read your book. Thank you for also talking about bedwetting and depression and sharing scans of your Hello Kitty diary from 1985… all the while still being sassy and fearless. Tina Fey: Sometimes I pretend you’re my fairy godmother. Or you’re Glenda and I’m Dorothy. Or you’re Marlon Brando and I’m Al Pacino. In any case, you’re a great writer. You make things happen and lots of people report to you. Thank you for being my inspiration. Thank you for writing the foreward for my most recent best-seller, always reading my first drafts…and for being my best friend. Funny post. I will gladly prepare the cruditas and cheese plates and refill the wine glasses for your next book club night with the ladies. No, no – you’re MINE!